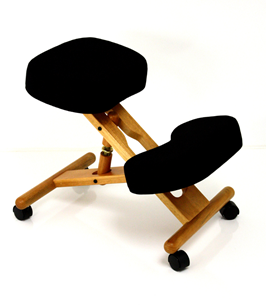 Jobri's luxuriously designed kneeling chair featuring rich wood elegance. PLUS edition has added benefit of Visco Elastic memory foam. F1455. Height range: 25" to 29"
Seat width: 16" x 12"
Knee cushion size: 18" x 9.5"
Five Year Warranty: Seat and back structures. Star Base. Chair control (steel structures). Structural parts. Casters. All moving parts.